Last year I fitted a CB to our Discovery. 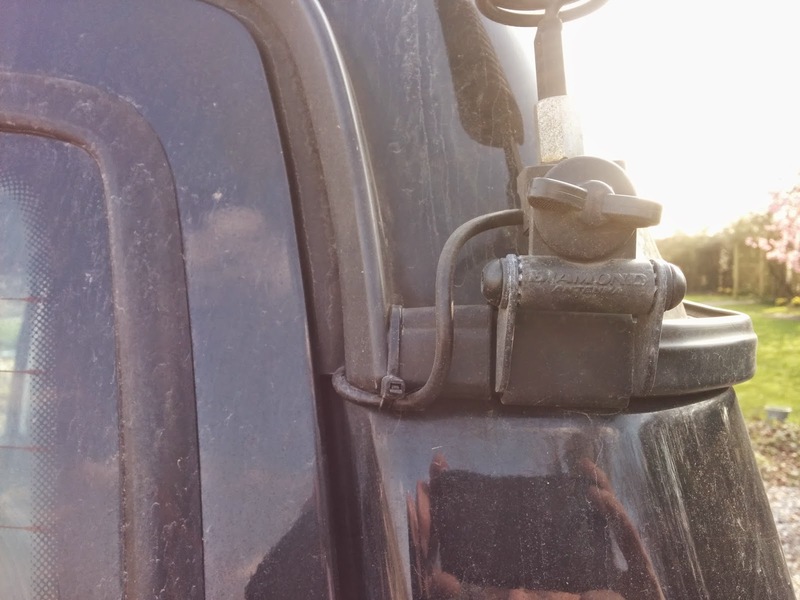 A common addition for off-roading. On a forum the other day I was asked if I had any photos of the cable run. Unfortunately I was in a hurry to go off-roading when I fitted it and didn't take any photos. The best I can do is take a few photos now and describe the cable run for the aerial. 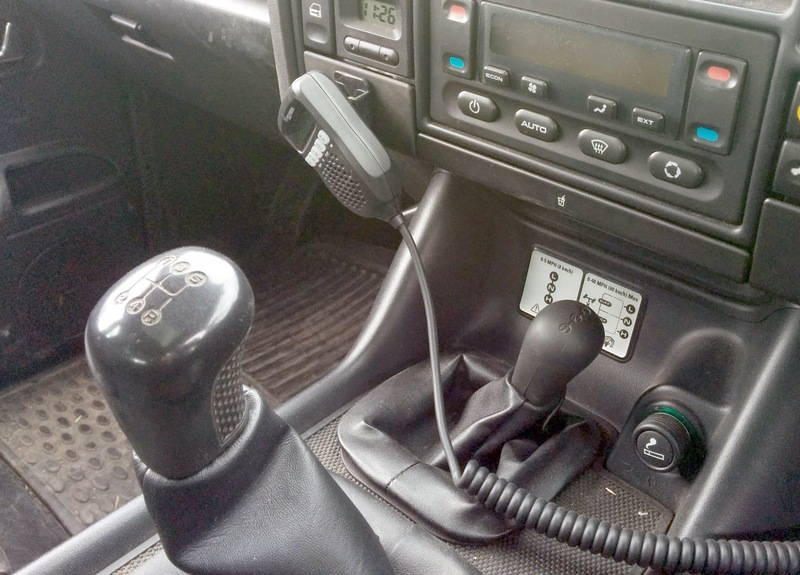 The CB is one that has all the controls on the handset so that the bulk of the electronics can be mounted out of sight. I fitted the CB under the drivers seat (UK right hand drive.) 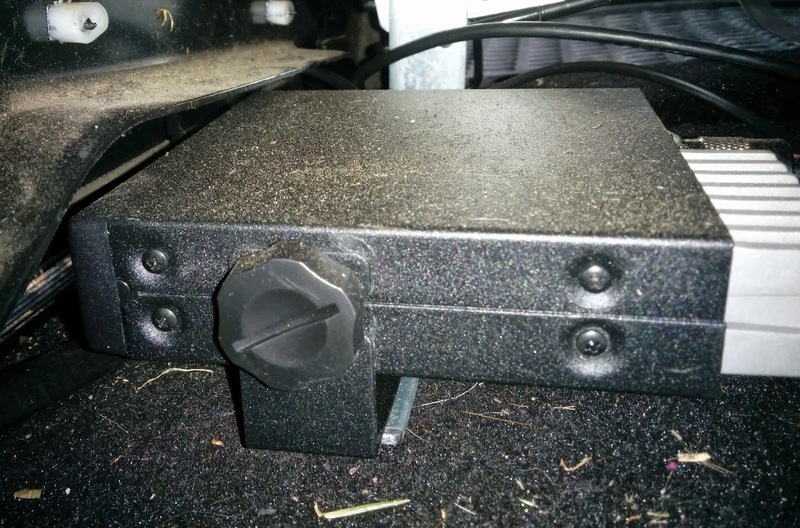 I had removed the old CD changer, long obsolete due to MP3s and mobile phones with Blutooth. The removal of the CD player left 4 very handy bolts sticking up. The CB mounting bracket fitted those bolts with only a little adjustment. As a side note I used the same bolts to fit a bracket under the seat for a fire extinguisher of the type required to meet UK Motor Sport Association (MSA) regulations. Recommended for most off-road activities and compulsory for some competitive events. There is some power under the seat but I decided to run a separate feed from the front. 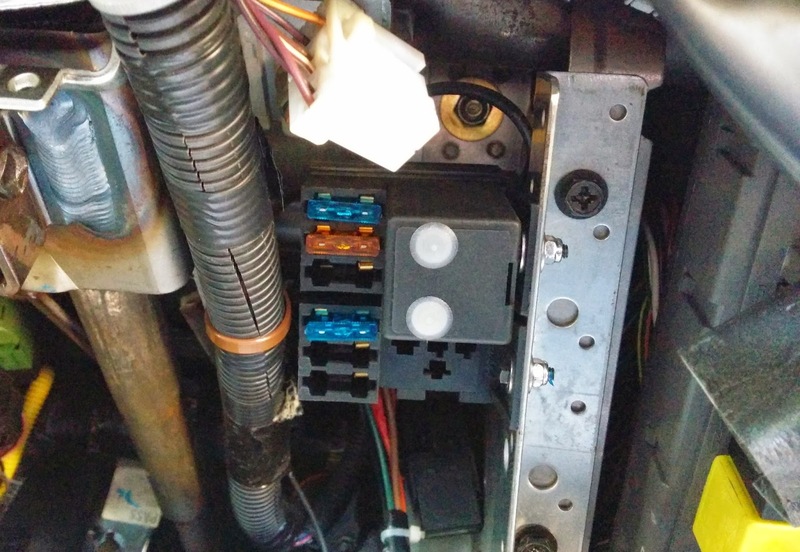 I have fitted an additional fuse box for accessories. It's under the steering column. 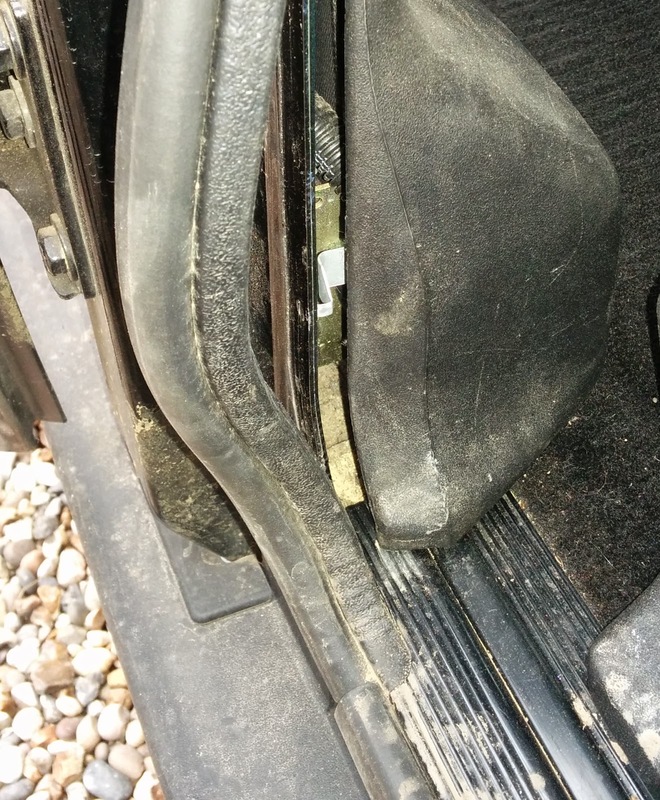 The plastic panel next to the accelerator pedal is easy to remove by pulling out the trim clips. That gets the cable as far as the foot well carpet. To be able to lift the carpet it is necessary to remove the plastic trim on the lip of the door. 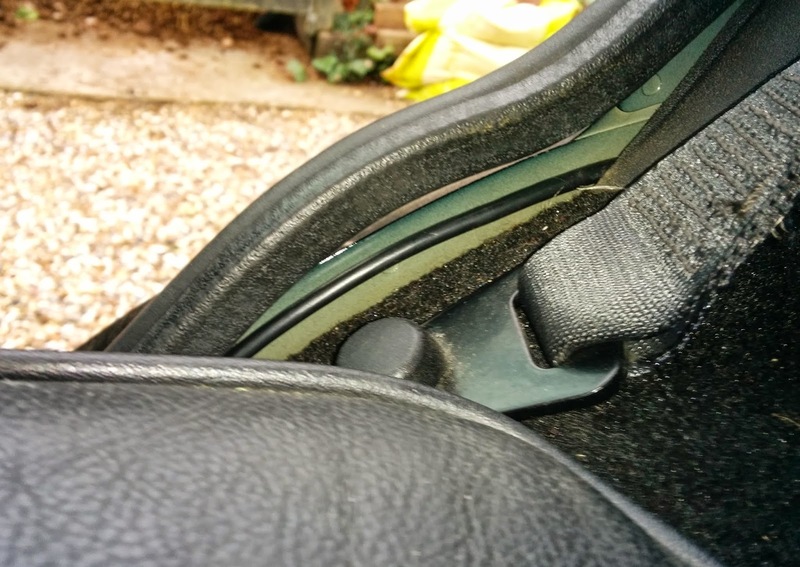 It's easier to do that if the trim round the seat belt real is pulled away. First pull off the rubber round the door then simply pull the tiny metal clip off the frame. That clears the end of the plastic insert for the carpet trim. The long trim insert can easily be pulled up to reveal the screws which need to be removed to release the carpet trim. I did the same for the back door and carpet which is where I was going to run the aerial lead. 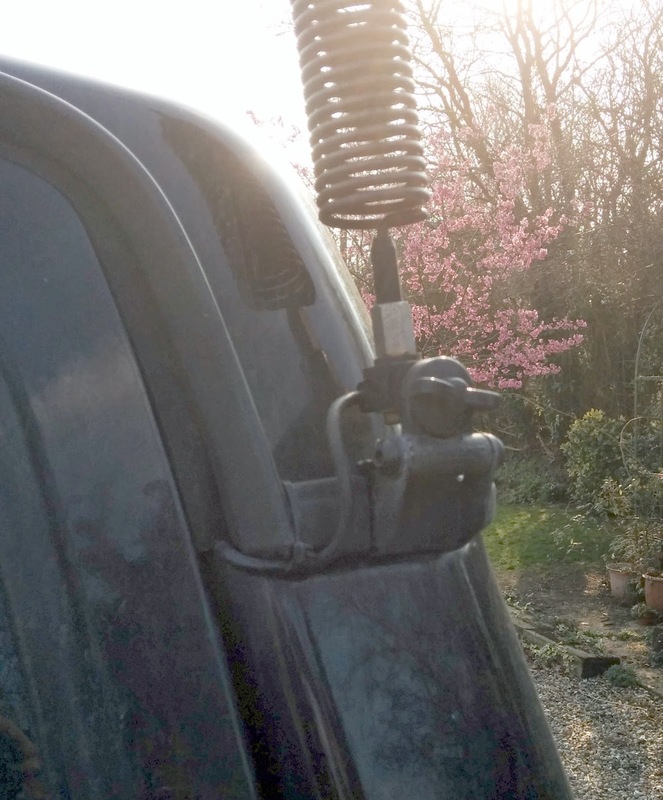 Without wanting to drill massive holes in the car the only way I could think to run the cable was to remove the big screw connector from the cable and refit one after I had finished. I left it attached to the aerial mount. I therefore had to work from the back of the car where I wanted to fit the aerial. The outer panel, with the rear lights in, is open top and bottom. At the top there is a small hole next to the gutter where the panel is up against the roof section. I threaded the cable through and managed to get a cable tie through another hole in the gutter to hold the cable in place. 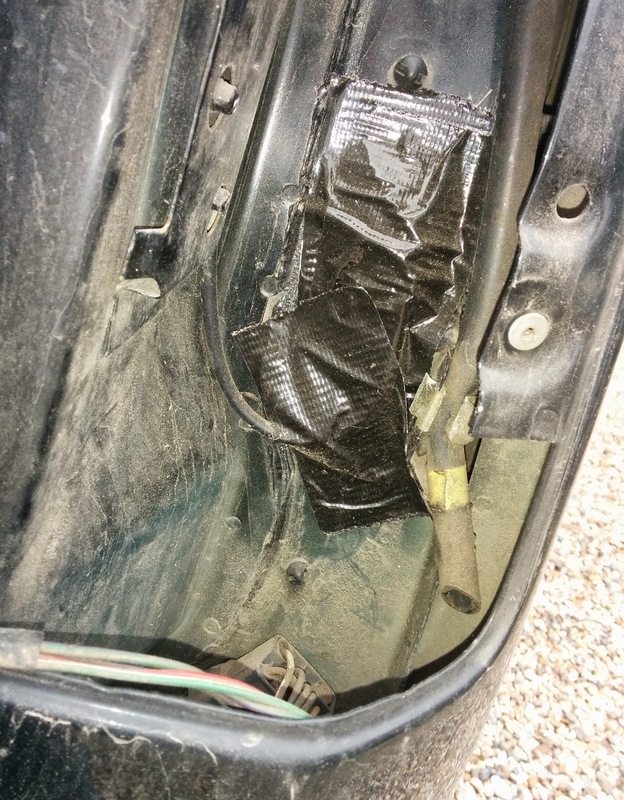 The cable is still outside the car between two panels. 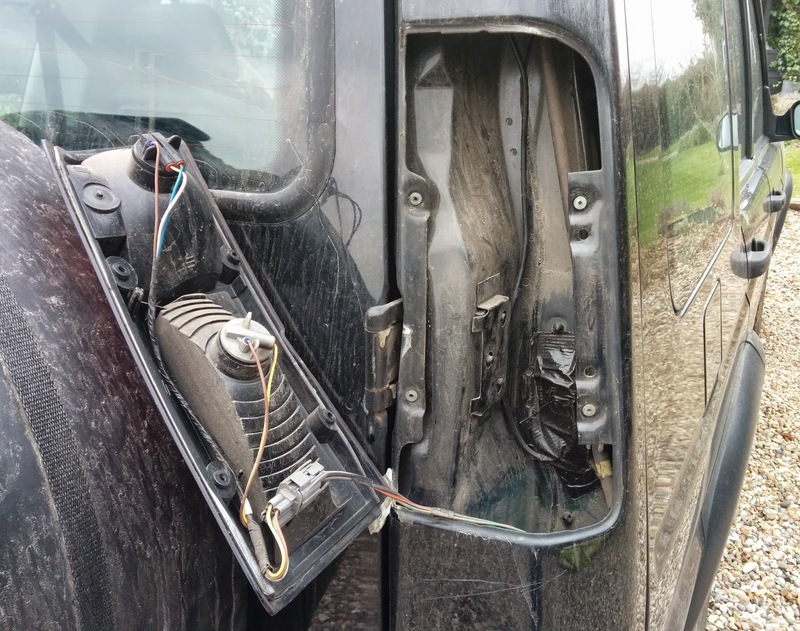 Luckily for me there is an unused hole through to the boot, behind the rear light panel. I covered the hole afterwards with sealant and some gaffa tape. 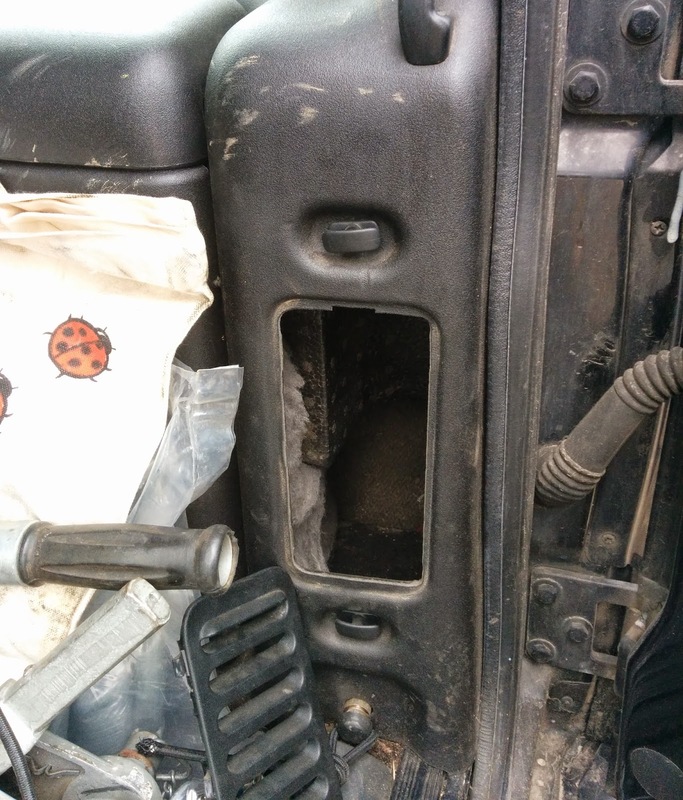 It comes out inside the plastic trim in the boot. 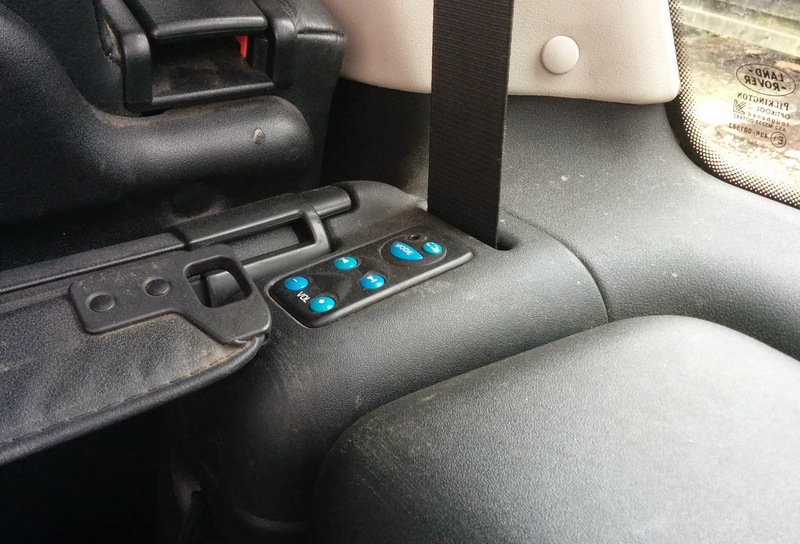 You can reach behind that by removing the vent near the rear door and the top of the trim just behind the seat where the rear seat belt passes through. 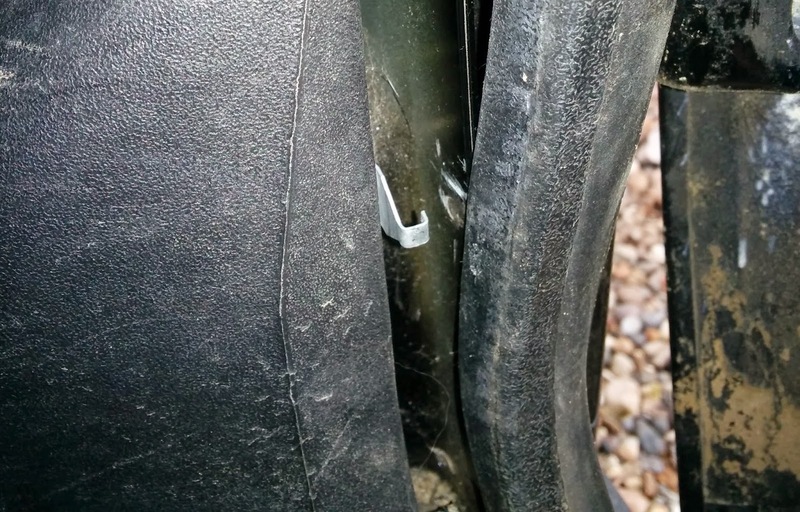 I am struggling to remember if I had to remove any of the trim clips to push the cable from the boot section over the rear wheel arch. Whatever I did was easy. I could not get the cable under the carpet but by pulling the rubber door seal the cable easily hides under that rubber seal when it is pushed back. 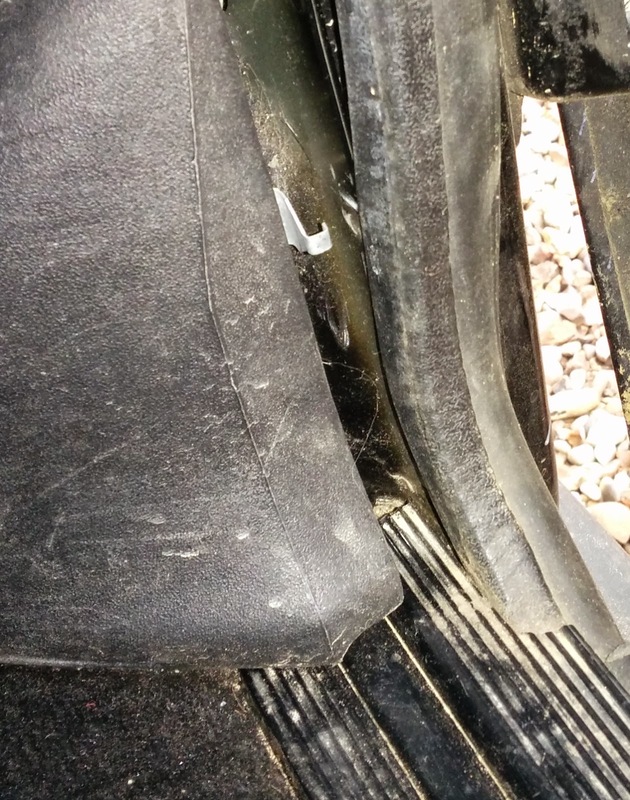 At the bottom of the wheel arch, with the carpet edge trim removed, the cable can go under the carpet until it is under the drivers seat. Put all the trim back and the cable is completely hidden. I soldered a connector back on, job done.